One day a week I set aside a 'prep' day when I am not in court and I have time to write lecture notes and generally plough through admin tasks. This means I earn less as there is a day each week when I do not get paid, but it also means I get my weekends free ( mostly) to do textiley stuff. Credit where credit is due (and not where it is not). When I was in Bath, De at Midsomer Quilting let me use her class room when the shop was shut to do some quilting - piecing is possible in the flat, quilting most definitely is not. I was making a reversible quilt and limited in thread to what I had with me/ could buy in the shop which (wonderful though it is) does not stock my preferred Bottom Line by Superior. So, I had a 30 weight Sulky in the bobbin ( way heavier than I would usually use but it looks good in the reversible back) and a King Tut in the top and set off doing my favourite leaf motif. All was well. I went out for lunch. Ate a wonderful cheesecake. Came back. Machine had a hissy fit. Probably because I did not bring her any creme egg cheesecake. No way would the tension work on the bottom. (My machine is definitely a girl machine). I cleaned her. I oiled her. I played with the tension. I talked nicely to her.I swapped the bobin case. I changed her needle and promised her a whole cake to herself. I turned the quilt upside down and reversed the threads. More hissy fitting. I turned her off and sulked all the way home. I had not even planned to quilt ( as opposed to piece) whilst I was away but now I had started, the new plan was to finish the thing and she was not playing along. BAD machine. Clearly she needed to go to hospital. I look in the local phone book. Bath Sewing Machine centre ( 'Two hours service: we collect') is five mins walk away albeit via some ridiculously steep streets. I ring at 8.30 the next am. Can he fix my Janome Memorycraft, NOW? Yes, he can do it if I bring in in straight away. Bring it? I thought he collected. No, not today because he is in the shop alone. I call a taxi. I get there. Shop closed. But hang on - didn't he answer the phone twenty mins ago? Apparently he has it on divert. I sit on a stone bench across the road and pretend I am an undercover cop on surveillance. The shop looks ominously shabby. The machines in the window are - well, antique. But then we use a magic cobbler at home who works out of a hovel and does great work. Means nothing. The man eventually arrives. He tells me off for ringing so early. (Excuse me? Why have your hovel, sorry, shop phone diverted to home if you don't want customers to ring you?) He peers at the machine. "Oooh." he says. "It be com-pew-'ur- ised. They're buggers them things when they go wrong, they are." (Anyone not familiar with a strong Somerset accent please think 'Pirates'). I put a protective hand on my machine. I am sure she shrinks towards me in a combination of contrition and fear that she might get left with this butcher. "Do you know what you are doing with it?" Right. He did lend me his phone book and I rang the Husqvarna centre which I had previously ignored despite knowing where it was since they are an entirely different brand. No problem, bring it in. I call another taxi. The driver's wife is a sewer of children's clothes and we talk overlockers and I pretend not to notice that he is driving the long way around under the pretext of not wanting me to have to cross the road when we get there. That's the road with the pedestrian crossing ten yards from the shop. At the Husqvarna Studio Bath the nice man in this Photo spends quite some time fiddling with it. Fixes it, won't charge me and lets me leave it there for a few hours while I go shopping. Nice man - go and buy some fabric from him if you are in Bath. Why I am I telling you this now? Because I have just finished the quilting and the machine is purring like a fluffy little lap cat. Good girl! Now, what happened to that dessert I could swear I left in the fridge? 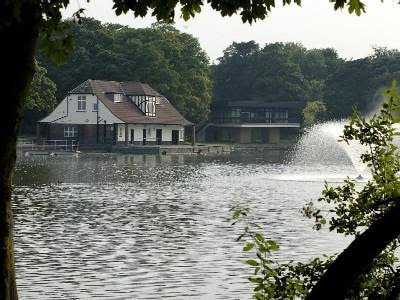 Yesterday Dennis and I went for a gentle stroll around Taylor Park. The park has a small wooded area with squirrels, a hill for kids to roll down and an enclosed adventure playground. But mostly it is a concrete pathway around this small lake come large pond. The building in the foreground is the old boat shed from the days ( back when I were a kid) when you could hire rowing boats. On a Sunday morning an ice cream van parks there. There are many small children in this park at weekend, including a number of toddlers on reins and little tots on their first bikes with stabilisers, particularly as you can imagine, around the ice cream van. "Sorry. He likes running around and tripping people up." "That's why he should be on a leash." I did not expect that this would cause a problem. But she started yelling "Excuse me? What did you just say?" (The question being rather redundant as she then repeated it to her husband who started shouting, "He's not doing any harm."). Because of (a) (b) and especially (c) above I turned around, and said "I am sorry but there are a lot of very small children around here and I am worried that one of them may get hurt or bitten" Husband then starts glaring at me. He is big. All I want is an ice cream and Dennis is hissing "Stop picking a fight." So I shake my head ruefully and walk away. Fairly fast. I am glad to see that by the time they catch us up at the van the dog is leashed. I am not saying the dog ( which was a kind of spaniel type thing) should not be in the park. By all means use one of those extending leashes so he can run and bound and be stopped in his tracks when he gets somewhere problematic. But to my mind, bounding spaniel + concrete path + toddling two year old can so easily = fall, broken bones and phobic child. Even if it is a dog which has no teeth whoatsover and therefore could not possible nip a child who panics and lashes out when this thing, which is not a huge dog but equals the size of a child, runs at them. But then, I do not own a dog. Am I being unreasonable? I have been promising myself a needlecase for a while. So, I sat down and made this one. The technique is not new or even hard and I know that some readers will be able to make it just by looking at the picture but just in case it is helpful for others, here are some instructions. The darker photos are more accurate when it comes to colour - I kept forgetting to put the flash on resulting in the lighter ones. One long piece of felt - mine was 2 3/4 inches by 12 inches. Selection of yarns for couching down. You only need them about 14 inches long so odd strands are fine. Thin strips of sheer fabric just over 12 inches long. Piece of fusible web (e.g. Bonbdaweb, Heat and Bond etc) same size as the first piece of felt. 1. Take the first piece of felt. If you have any, spray baste it lightly, otherwise use pins where needed. Rip strips of sheer fabrics ( I only needed three) and lay them on the felt overlapping. They can spill over the edges of the felt. 2. Using one of your machine threads stitch several wiggly lines to secure the sheers. Trim the piece back to the size of the felt. 3. Using a machine thread in the top, and either a couching foot if you like or ( as I did it because my yarns were too bobbly to go in the couching foot) a normal presser foot, couch down several interesting yarns vertically down the sheer/felt piece. make them more or less straight but do not stress about slight deviations and wiggles. Use a zig zag stitch for this. 4. Change machine threads for variety and choose a decorative stitch on your machine. Stitch down between several of the gaps between the couched yarns. Change threads and stitch for variety and fill in all the other gaps. 5. I then added the yarn which has (for want of a better description) big fuzzy bits hanging off it. I did this last so the big fuzzy things didn't get in the way. If you have no big bits like this you can skip this step. 6. Trim back to the felt base eliminating all straggle ends of thread. 7. Take three of four of your smoother yarns and make machine wrapped cord. That is, just stitch over them with a zig zag stitch. Take a suitable length, form into a loop and using a zigzag stitch that is much looser together stitch the ends together to make a kind of twig like ending. Stitch that by hand using a couching type stitch to one end of your now decorated panel positioning it so the loop will pass over the bead you are later going to add as fastening on the other end. 8. Fuse the back of the decorated fabric to the wrong size of the lining fabric. Using appropriately coloured bobbin thread, sew around the combined panel in a zig zag stitch - twice if need be to seal the edges. 9. Place the second felt piece on top of the lining fabric and pin the two short edges together. I chose to allow my lining fabric to show - if you don't want that make the second piece of felt the same size as the decorated panel. Just make sure the short edges match up. Fold the case so the lining sides face and crease to find the middle. Stitch the second piece of felt down that seam to create a kind of book spine. 10. Flip the piece over. Sew just along the inner edge of the zig zag edging stitches you created earlier on the short sides. This will result in the inner felt piece being secured in three places but loose elsewhere to allow you to put needles and pins in. 11. Press the fold to get the case to sit flat. 12. Sewing through the top decorative piece only ( not the inner felt strip) add the bead and put the loop over it to fasten. Voila - a needle case. Posts are better with photos even if the photos don't really relate to the text. In the Circus in Bath ( the swanky place to live ) there are some huge trees in the giant roundabout that is the Circus. And I am not averse to lying on my back in wet grass if it means I get a photo from an angle that is not on all the postcards. So here to day are pictures of those trees. And a wonderfully twisted one from down the road in Queens Square for good measure. 1. Has any one done the Sydney Bridge Climb or know of anyone who has? I need an honest account before I decide to do it or not. 2. Can you all stop blogging for a little while? I took a holiday. I have been reading diligently since I returned and I still have 484 posts to read. Pause your posting or I shall delete you . You have been warned. 3. I stepped out of Warrington County Court yesterday to get a pad of writing paper. Just plain A4 size. The stationers who shall not be named but have a sign that said WH Smith outside had two pads that size - white or cream - for £9.99. What? When did paper start costing that and how did I miss it happening? 4. My laptop keeps playing peekaboo with the wireless connection. Sometimes it connects sometimes it will not. Any ideas? 5. I sat down to watch Judge Judy and eat at 6pm. It is now 20.54 and I have done nothing all evening. How did that happen? ... Oh Oh! I just went to their site to get a photo for you and found that they have a whole gallery and I am on it!! What a surprise! - go here and check out the fab shop decoration ( they give you free coffee when you go there and you can wander the stacks with it in your hand) and scroll to the section for the regional award ceremony - that's me in the pink jacket with Dennis. Take particular note of Vlaska the shop dog who is very quiet and erudite and chooses competition winners by licking one of a pile of bones with customers names written on. 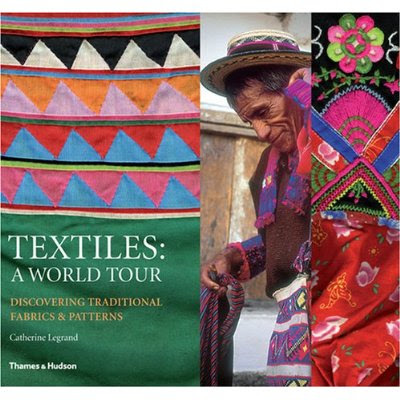 This time Dennis bought me this book in place of an Easter Egg - it is fabulous - a mix of textiles and travel and amazing photography. I recommend it. I still got my egg though albeit sneakily. We had the pleasure of taking De, Chris and Brigitta from Midsomer Quilting out to their local pub the Somerset Wagon where they served Creme Egg cheesecake - such a good idea! On our return it was straight back the study for two days dealing with piles of admin and lecture note writing. I was beginning to forget the benefit of the holiday until the Little Miss next door (aged 6) came and asked to play with me. We made chocolate cake and kicked a ball around the garden. Sometimes it is good to be reminded that the best part of life is licking the bowl!